Gorgeous pieces of natural Aquamarine, just about the right size to hold in your hand or place on your body when meditating. Wonderful "Aquamariney" colour too ! Aquamarine translates as "Water of the Sea" due to its water like colour and properties. It offers protection on sea voyages and has long been used as a talisman by seafarers. It stimulates the natural healing properties of the body. It also helps with swollen glands, sore throats, jaws, teeth, eyes and stomach. Aquamarine is very good for allergy sufferers, particularly those with Hayfever. Improves confidence and the ability to "stand your ground". Helps you to take responsibility for your own actions. Brings clarity of mind. Aids self expression and the flow of communication. Helps to banish fears, doubts and phobias. 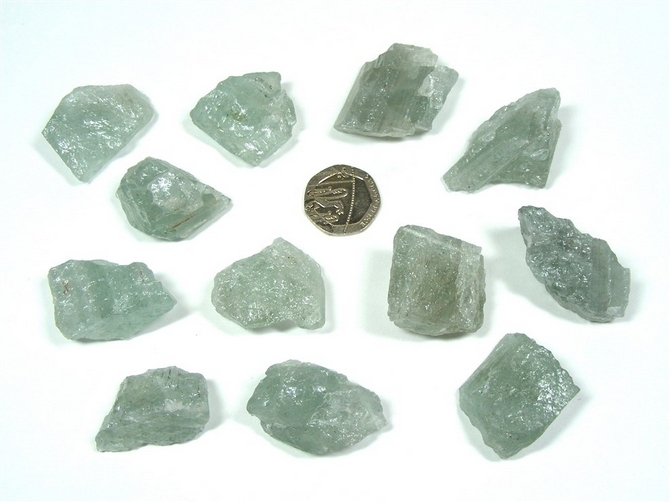 Aquamarine helps to bring tolerance to judgmental people. A good stone for relationships as it symbolises hope and happiness. A stone of gentleness and of compassion. Provides shielding properties for the aura and the subtle bodies.